Take a look at some of the sad and bad that happened. Unfortunately, I don't have any pictures of the incredibly bad way the traces were before I started meddling. These are from halfway through this adventure. 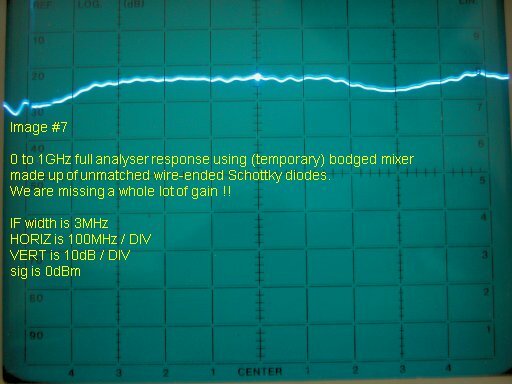 Before I finally used the surface mount Agilent(TM) HSMS -8202 dual "zero bias" Schottkys, I needed to find out if it was totally kaput, so I soldered in some small glass bodied, wire-ended BAT85 diodes in a little cluster with the wires as short as I could contrive. This illustrates the importance of balance. I made no attempt to select them. A couple were consigned to semiconductor paradise from the glass shattering as I tried to bend the leads into place. The results were much better than before, but still a long way short of acceptable. 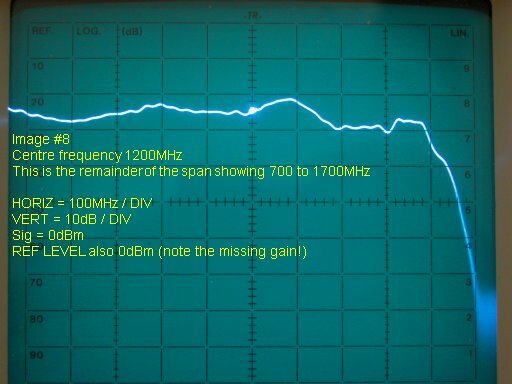 Notice that is a 0dBm signal that is 24dB down from the top of the screen! Quite aside from the bad mixer diode problem, we don't know how much of that yuk display is because of the response of the junky piece of link cable. For all we know -it could be faulty. Now that we have got it (sort of) working, it is time to eliminate this source of error. And.. We figure out the trick behind those plastic bits! By now, we know that tweaking really good performance out of microwave bits is going to need some empirical artistry. Its probably part of a big bag of tricks the production test experts will do to make a part meet its spec. I am out to discover at least some of them.